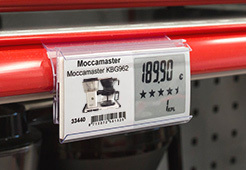 Lightweight price label with features, including dynamic pricing, RFID, Antitheft. Dynamic pricing allows retailers to take advantage of happy hour-, season sale-, peak- and end-of-season pricing. Pricing is easy, flexible and remote-controlled. 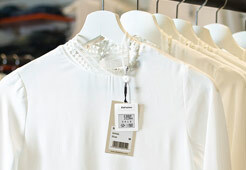 With just a push of a button the prices of the selected garments are changed within a store or across a chain of stores. Maintenance and price updates can be performed remotely, saving countless work hours. The two-way radio enables effective and timely reporting while all price updates are automatically acknowledged. EllaFashion dynamic pricing system comes with tools to create customized reporting system. All EllaFashion Price Tags are reusable and sustainable with estimated lifetime of 5-7 years. Dynamic and digital pricing is a unique way to maximize sales, profit and margins. 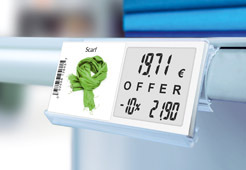 EllaRetail offers different kinds of paperlike price labels: for example our 4-color shelf label covers a lot of pricing needs, but also the postcard and A4-sized price labels come in handy in many occasions. EllaRetail and EllaFashion labels are based on e-paper technology to answer the true needs of retail business. The label displays the price but does not attract unwanted attention. It is light-weight, small and energy efficient. Getting started is easy and economical. Our ESL price labels combine the best qualities of an electronic and paper label: e-paper technology enables the paper-like look. Pricing information that can be changed is displayed on the right side. Product information sticker with product name, EAN and product code is on the left side of the label. EllaFashion Solution consists of price displays, two-way radio equipment and controller software. The superior visual and functional properties of EllaFashion Solution make it an attractive choice for most different environments; from an exclusive boutique to outlets and anything in between. Retailer saves money and receives a reliable tool for maximizing sales, profit and margins. EllaFittingRoom is a smart fitting room that works together with MariElla labels. It helps customers to try and buy more and the efficient anti-theft features help you to achieve minimum shrinkage. With the EllaFittingRoom Solution enabled, the customer can easily request different size, color or different garments via tablet. EllaFittingRoom solution also calculates garments (i.e. EllaFashion price labels) arriving and leaving the fitting rooms continously and reports all kinds of unusual behaviour.